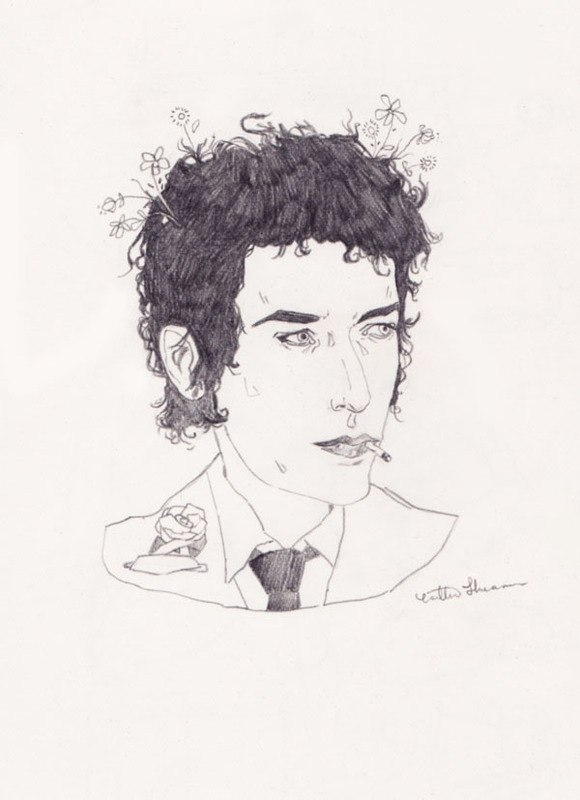 a commissioned tattoo design of Bob Dylan. aw Crissy, you're always so wonderfully kind! I don't think i'll be adding them to the shop as prints because they were special commissions - sorry about that. I am really impressed in your work. Do you accept doing portraits? I will just send the photo and we can talk about the price. Yes, i love to make portraits from photographs and would be glad to make one for you. please email me at caitlin.shhh@hotmail.com if you would like to discuss the idea some more. hehe so cool! I love the flowers sprouting amongst his hair. I wish it was my hair even. Ol' Bob did always have enviable hair. wild and unruly and just how i like it too! So gorgeous, Caitlin. So excited to see the final outcome of the one you're doing for me. i'm just about to send you a scan!